Jane, a seemingly capable young woman, is haunted by Ophelia (yes, that Ophelia) who lives underwater in Jane’s bathtub, surrounded by garlands of flowers. Ophelia, in turn, is haunted by her beloved older brother, Adam, with whom she is close. Much too close. This bizarre situation is puzzling to the audience, but immensely entertaining. As Jane and Edmund, Katherine Otis and Will Trichon are touching and funny as they rather desperately pretend to be who they are not. The hallucinatory Ophelia and her brother Adam (Kirsten Dwyer and Ryan Hayes) are equally amusing in their own disturbing fantasy life. I don’t think I’ll spoil the viewer’s appreciation of Rachel Stayer’s fascinating play by revealing that Ophelia is a younger version of Jane. Jane is haunted by a memory she tries to deny: her beloved elder brother abused her sexually. Ophelia will not be denied; she will be heard and reckoned with whether Jane likes it or not, just as the original Ophelia in “Hamlet” intruded with her madness upon the court of Denmark. 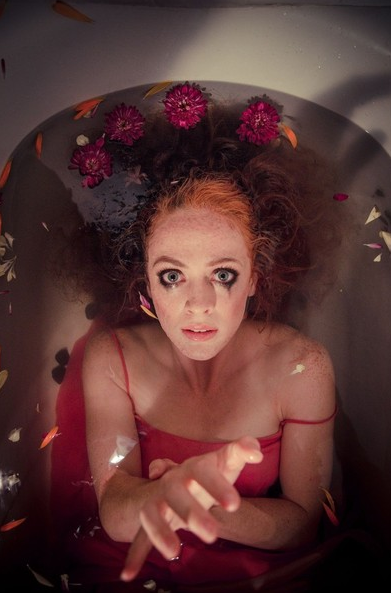 Kirsten Dwyer as the mad Ophelia in the world premiere production of “Drowning Ophelia” by Repurposed Theatre. Photo credit: Robbie Sweeny. Jane managers to keep her sanity (barely) by constructing a fantasy world with Edmund, but she is unravelling, and if she is to survive she must figuratively drown Ophelia, which is the story of the play. Rachel Stayer has constructed an extraordinary and moving script from these elements. Her language is witty, poetic and psychologically true. Her interesting riffs on Shakespeare’s language in Hamlet are skillfully done and add a lot of theatrical interest. Director Ellery Schaar (who is also the producer and founder of Repurposed Theatre) has done a wonderful job with this piece. The actors have been skillfully coached to bring out the psychological nuances of each situation and their movement about the small set is consistently interesting. Schaar designed the set, as well as directing, and the simple design, featuring little more than a dining table with chairs and the aforementioned bathtub, is very effective. The other design elements — lighting, sound, costuming, even makeup — are notably well realized. The lighting in particular (by Julian Elstob) adds a great deal of visual interest and is psychologically probing. This is the premiere production of Repurposed Theatre and seems to indicate that an excellent new company is being established. Pay attention! “Drowning Ophelia” a world premiere by Rachel Luann Strayer, produced by Repurposed Theatre. Director: Ellery Schaar. Scenic Design: Ellery Schaar. Lighting Design: Julien Elstob. Sound Design: Ellery Schaar/Galen Tsongas. Costume Design: Ellery Schaar. Fight Choreographer: Stebve Bologna. Jane: Katherine Otis. Edmund: Will Trichon. Opehlia: Kirsten Dwyer. Adam: Ryan Hayes.